This haul was from a while ago, so these are my thoughts on the old site, before Testerkorea had a total site overhaul in June, 2014. I have not ordered from them since. Unfortunately, my second shopping experience was not as fantastic as my first one, but it was still great service! As you can see, the order process was a pain. It took around a week and a half for everything to be shipped. The package arrived surprisingly quickly through standard shipping though (four working days)! 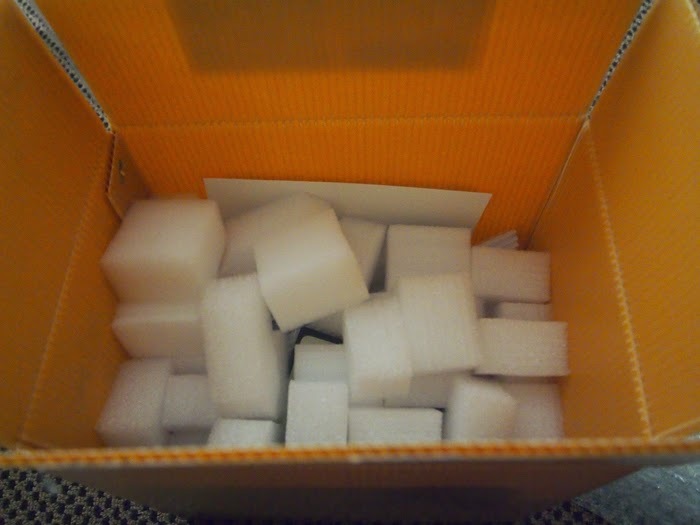 Oh, so many foam pieces! This is the single most expensive haul I've ever done! I really wanted to throw in the Skinfood Avocado Oil as well... maybe next time. Actually, I feel a bit bad about spending so much money right now. 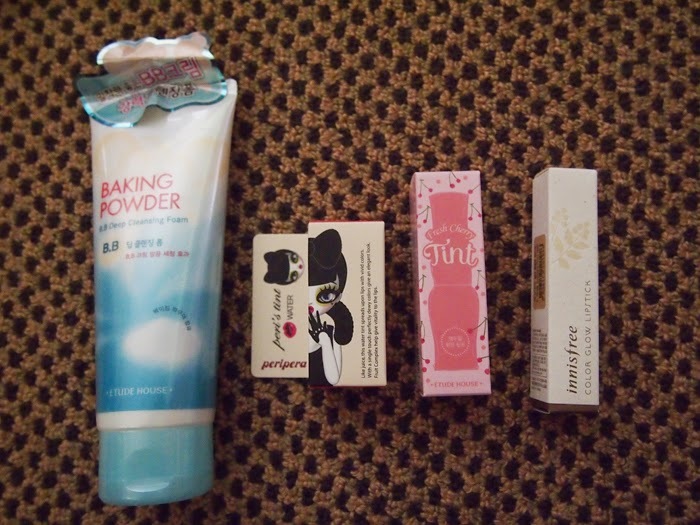 The entire haul... it looks like so little haha. 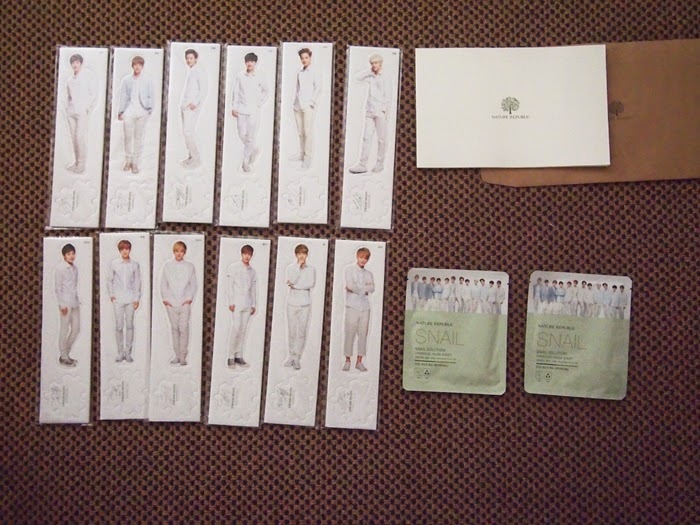 Nature Republic EXO standees, photobook, and Snail Solution Hydro Gel Masks. I decided to purchase the Baking Powder BB Cleanser because I've read good reviews about it taking off BB cream. I've already repurchased a second tube from Jolse. I think it's a bit drying and needs a follow up with another remover, but it has a great lemony scent and scrubby bits that I like. I think Candy Juice (and Mandarin Juice) used to be a Gmarket exclusive colour. Now you can get it as a regular colour. At first, the tint has a really lovely fruity smell. After a month or so of infrequent use, the brush started to shed a lot inside the bottle and Mari Kim's beautiful design is all smudged off the applicator handle. Not sure if I'd buy it again. I'd repurchase the Cherry Pink Tony Tint if I wanted a watery pinkish-red again and wouldn't even consider the Cherry Pink that Peripera does. Etude House Fresh Cherry Tint in Cherry Pink is my love. Great tint and colour. It's so beautiful and easy to apply. It smells like grape candy. I will make a repurchase. I wish I picked up the limited edition Cherry Coral (** end of September edit. I purchased it on ebay for $6.28. Score!). major regret right there. Only picked up the Cherry Lavender in June. Innisfree Color Glow Lipstick in Maple Burgundy was a birthday present for my mum. It's such a lovely reddish colour. It's a bit sheer, but it is buildable. I love the design and packaging of the lipstick. So chic and sleek. I'm always curious about higher end brands and their products. A lady in Chinatown recommended O HUI to me. I immediately thought 'I can't afford that brand! And my skin is definitely not mature enough for this type of skincare.' 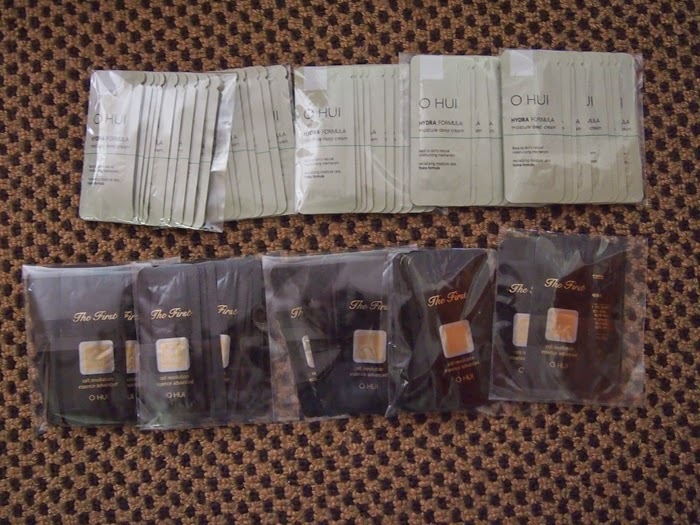 She told me that O HUI is a department store brand that is great for dry skin. She let me try a few of the products and I got convinced to buy some samples. These samples lasted me for approximately four months of continuous day and night use. Each packet lasted me around two days (four applications) throughout Autumn and Winter. I would reconsider repurchasing the cream (smells like pineapple) but not the essence. The essence is too rich for my skin right now, and I do think the stem cell lines are aimed at more mature skin types (yes, whatever that means). The cream is very luxurious and made my face feel fabulous. It gave me an oily sheen ('glowy look') which I almost never experience so I did not mind it much. 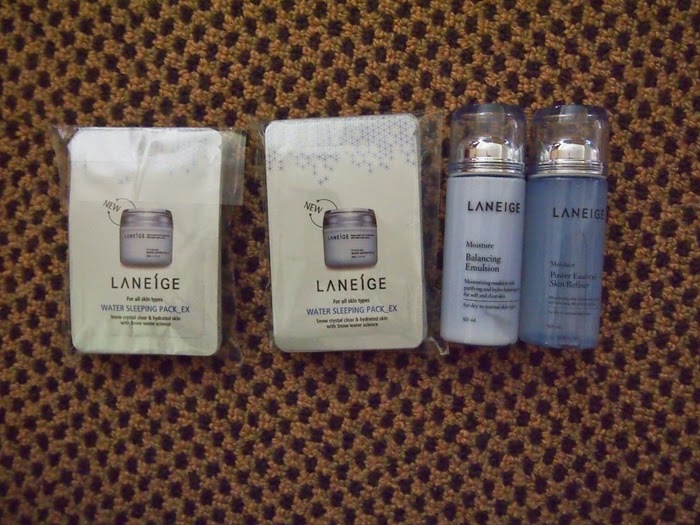 I love the Laneige Water Sleeping Pack_EX! I decided to buy it in samples because it was cheaper than buying the full size in a jar again (Sasa is now selling it for over $30 AUD compared to the $21 AUD I paid for it last year. This does not include the fluctuating exchange rate). The Moisture Balancing Emulsion and the Power Essential Skin Refiner made my skin so soft and beautiful. I am considering buying the set in full size. Unfortunately, that means I will have to blow $70+ AUD for both items. Perhaps it will work out cheaper if I keep on buying the sample sizes? 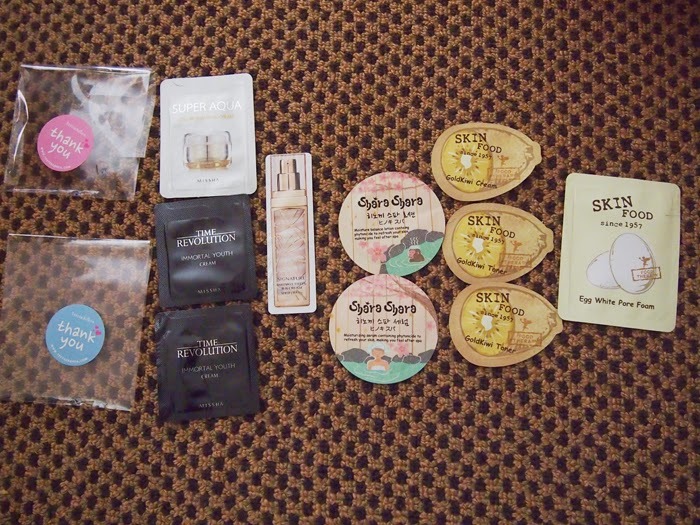 I received two packets of five free samples for this haul. My only dissatisfaction was how long it took to confirm my order. The team member who responded to me seemed rude in their reply the first time around, but that may have been due to language barriers or other types of miscommunication. Thankfully, their second reply was much nicer and more polite. Most of the time, you can get good deals on Testerkorea, but the little things you put in your cart can dramatically increase the cost of shipping (especially sheet masks!). Next time, I think I will stick to ordering full sized items only when there is a sale and then include only a few packets of samples rather than enough samples to make up a full product. 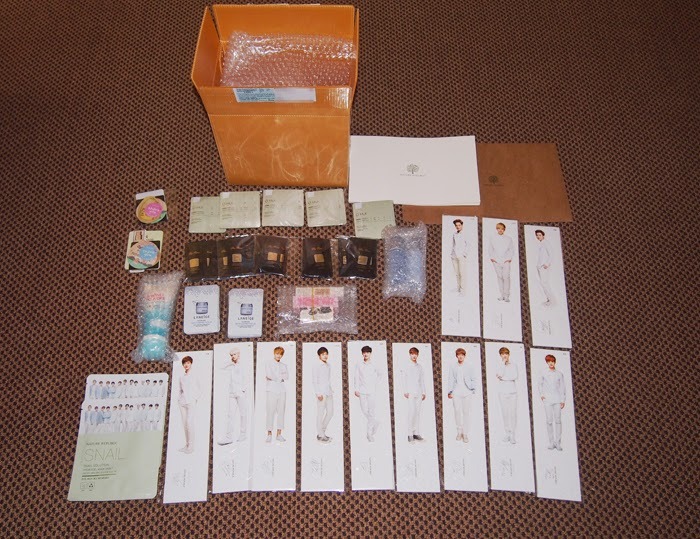 I've noticed that their samples can be overpriced and that you can find it is much cheaper to purchase on ebay. This however, depends on the brand and availabilities. Please be a smart shopper and remember to compare prices first! So, that was my last experience with their old site. What has been your experiences ordering from Testerkorea post June 2014?